Join us for our Teen Service Project and Movie Night this Friday, April 13, at 7PM, only at the North Logan City Library! We will be making videos of kids stuffed animals around the library doing crazy things along with other activities, have a pizza dinner and watch a movie, ending the night at midnight! 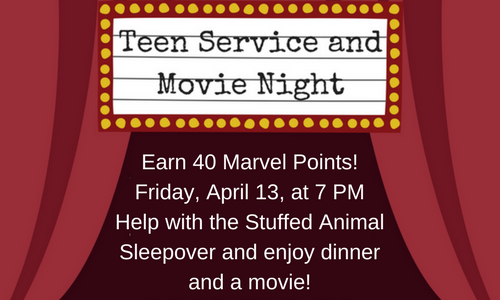 Since this is a Service Project AND a Teen Movie night you can earn 40 Marvel Points by showing up and helping out! If you have any food allergies or sensitivities please let us know! We want everyone to have a good time! This activity is for teens grades 6-12. Thank You!